In addition, a number of Saurer business lines are celebrating anniversaries this year, the most long-lived of which, the embroidery business, was founded 150 years ago. To be a part of these festivities and to find out more about its solutions, visit Saurer at Stand B201 in Hall 6. The innovations that Saurer Spinning Solutions will show at ITMA include new machinery, automation and digitisation technologies as well as quality-determining components and services. Saurer’s solution approach is also integrated into the product portfolio of the segment. 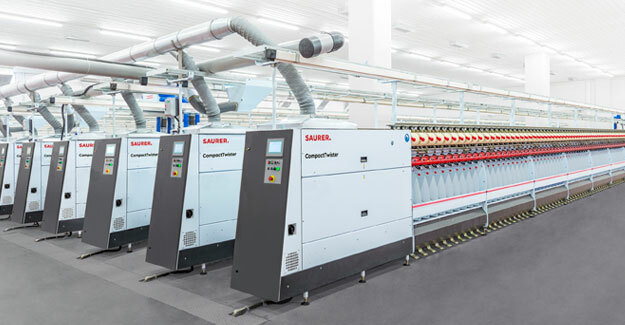 Managing the spinning value chain from finalised package down to fibres gives Saurer a knowledge base that translates into a competitive advantage for its customers. For Saurer, the solution consists of more than just machinery. Automation, digitisation, service, training, consulting and even project financing are integral parts of a smart offering, conceptualised with customers’ top-of-mind requirements. The extension of the value chain from bale to package allows Saurer to have complete control over yarn quality along the entire process. While focusing on delivering perfect package quality for each spinning application from one source, the systems are divided into ring spinning (Zinser System) and open-end spinning (Schlafhorst System). The Zinser System focuses on flexibility and intelligent linkage in high-speed ring spinning, and features a new modular structure and intelligent RFID-based material flow. In open-end spinning, the Schlafhorst System embodies versatility with solutions for different yarn structures. The Saurer Technologies Segment is also presenting an array of innovative products. The direct cabling machine CableCorder CC5 is already in its fifth generation – this version is more economical and features a smart spindle concept as well as smart quality control and software solutions. Customers in the carpet yarn sector find a complete solution in the new series of CarpetCabler/CarpetTwister. Saurer will be launching the latest generation of the CompactTwister, which has already demonstrated its dominance in the market with sales of over four million spindles. Saurer’s complete top-down embroidery solution helps customers complete each step of the ennoblement process, from the first drawing of the design to the final stitch on the Epoca 7 machine. Its HeadLine application system, also incorporating a new laser head that can cut virtually any fabric, allows customers to produce limitless designs. Automation features have resulted in a dramatic increase in productivity. The elastomer components business line fulfils customers’ need for a ring-spinning cot with a hardness of 68 Shore A, completing the range of Accotex J-series cots from soft to hard with different lifetimes for different applications.The latest airjet-spinning aprons feature a redesigned composition of the inner layer in combination with a newly designed knurled structure, resulting in even gentler yarn treatment.